Train, bus and ferry: This is three stage journey. First stage is take a train from Hat Yai to Surat Thani. The second stage is then to take a bus from Surat Thani train station to one of the ferry ports in Donsak. The final stage of the journey is to take a ferry from Donsak to Koh Phangan. Minivan, bus and ferry: This route involves taking a minivan from Hat Yai bus station to Surat Thani town, from Surat Thani town taking a bus to Donsak, and from Donsak taking a ferry to complete your journey to Koh Phangan. Minivan and ferry: Jolly Travel operates a direct service. This is a two stage journey: first, you take a minivan to Donsak Raja Ferry Port and then you take a ferry to Koh Phangan. This is the quickest and easiest of the three ways to travel from Hat Yai to Koh Phangan because you avoid the need to travel into Surat Thani and then come to Donsak by bus, which adds an additional 2 hours to the journey compared to travelling direct from Hat Yai to Donsak. The Jolly Travel service departs from Hat Yai city centre, which is 2 km walking distance from Hat Yai bus station so make sure you go to the city centre bus stop rather than the main bus station or you may miss your departure. Use the Search Box below to find tickets for the direct service from Hat Yai to Koh Phangan. Secure online payment by PayPal, debit or credit card. Instant ticket confirmation and electronic voucher sent by e-mail. The first part of the journey with Jolly Travel to Koh Phangan is by minivan from Hat Yai to Donsak Raja Ferry Port. This is a journey of 311 km which takes around 4 hours 23 minutes to 4 hours 57 minutes depending on the exact route the minivan takes. The precise route varies from day to day as the minivan driver avoids road works and other delays to seek out the quickest route from Hat Yai to Donsak Raja Ferry Port. The minivan will usually stop once on route for around 20 minutes at a roadside service station to allow passengers to leave the minivan to visit the toilet and buy food and drinks at the shop or restaurant at the service station. The second stage of the journey is by car ferry from Donsak to Koh Phangan Ferry Port. 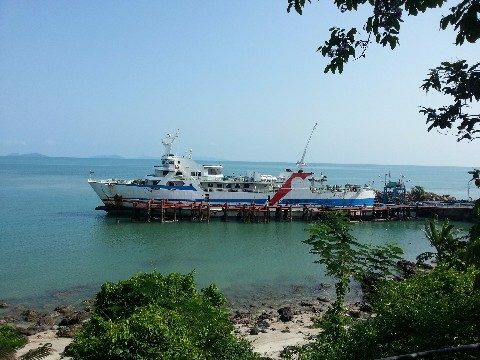 The minivan part of this journey is scheduled to arrive in time for passengers to connect with the 14.00 ferry departure to Koh Phangan. The sailing time by car ferry from Donsak to Koh Phangan is 2 hours 30 minutes which means that passengers arrive in Koh Phangan at 16.30. If the minivan is delayed and arrives after 14.00 then passengers need to wait until 16.00 for the next car ferry to Koh Phangan which arrives at the later time of 18.30. The Raja Car Ferry is a basic low cost ferry service with comfortable seating indoors, a small shop and outside areas with seating. The Jolly Travel service from Hat Yai to Koh Phangan departs from in front of the Red Planet Hotel, which is 500 metres walk away from Hat Yai train station and located in the centre of the busiest part of Hat Yai city. There are no meter taxis in Koh Phangan. If you do not want to take a shared taxi then your alternatives are to take a motorbike taxi or to hire out a whole car. For both motorbike taxis and the hire of a whole car there are no fixed prices and you need to negotiate a price. Motorbike taxis charge around 100 THB more for a journey than a shared taxi, and expect to pay over a 1,000 THB to hire a whole car for any journey from Koh Phangan Ferry Port. Direct services from Hat Yai to Koh Phangan terminate at Thong Sala Pier.